Ronald Mack (left), executive director of Legacy Equine Foundation, presents Dion Compton with the foundation's scholarship. Photo by Matt Barton, UK Ag Communications. 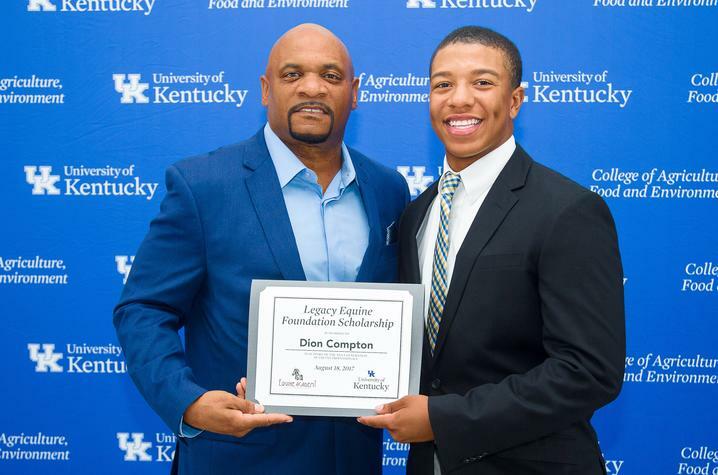 LEXINGTON, Ky. (Sept. 14, 2017) — Dion Compton, a University of Kentucky freshman and Lexington native majoring in equine science and management and minoring in business, was recently awarded an inaugural scholarship through the Legacy Equine Foundation. Compton attended Tates Creek High School and Locust Trace AgriScience Center, where he was vice president of their FFA chapter from 2016-2017. Compton was also awarded the Junior Achievement “Business Competition” award in 2017, served on the Principal’s Advisory Council at Tates Creek and Locust Trace, and was awarded the William C. Parker Scholarship in 2017. The Legacy Ball was held for the first time in 2017 and will be an annual event. According to Mack, the Legacy Ball benefits Lexington and the surrounding community through an equine scholarship outreach program targeting rising African-American high school seniors interested in pursuing the equine industry as a career. The program was developed to promote and improve self-esteem by empowering local youth with knowledge of their heritage, which is key in developing leadership in the community.